What else not collapsed in sri lanka except going up in global high ranking in corruption index? What a shame? 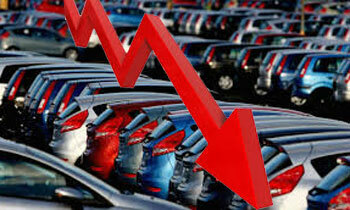 A 40% drop in showroom traffic means the automobile market COLLAPSED 40%? Go home DM, you're drunk! Good news to the ordinary citizens of Sri Lanka and the environment. Now is the time for the government to improve the public transport, specially the SLTB and the railway. Build light railway systems in the city and reduce the pollution and traffic on the roads. Leasing companiess should mobilise their resources towards productive economic sectors, not to make innocent insolvent or bankrupt. He he he ..... feel sorry for the people who were fooled by "a car for everyone" ! Less vehicles on the streets less accidents. No vehicles on the streets no accidents. Not only automobile all the Markets are collapsing Agro based Small-Medium enterprises already collapsed.The rest are struggling and it is only a matter of time. Don't tell lies. If you travel from Borella to Kaduwela you will find new car sales almost every 50 meters. Most of these place have come to existence since the last budget. Selling vehicles is the best loved business in Sri Lanka. Heard of a VW plant in Sri Lanka? The government decision on this matter right even though the leasing rate should be increased by another atleast 10%. Because at present most the vehicle run @ road on credit basis. Financially this situation not good for the future. At the same time with limited road space it is not possible to permit buy all interested people with less financial ability. Whatever the finance minister touches turns to rubbish. The only solution for you is to sell the vehicle on installment basis by the motor company not involving the leasing companies.